A newspaper article about Dr. Cal Fowler (1929-2013) and B. G. MacNabb presenting an engraved launch key to astronaut Wally Schirra (1923-2007) Dr. Fowler, the Launch Conductor at Cape Canaveral Air Force Station (CCAFS)'s Launch Complex 14 (LC-14) in Cape Canaveral, Florida, used the key to launch Schirra's spacecraft, Sigma 7, into orbit on October 3, 1962. Mercury-Atlas 8 (MA-8) was the fifth manned space mission and was launched as part of Project Mercury. 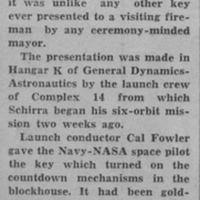 Original newspaper article: "Countdown 'Key' Given to Schirra by Convair Crew." 1963: Private Collection of Dr. Calvin D. Fowler. Digital reproduction of original newspaper article: "Countdown 'Key' Given to Schirra by Convair Crew." 1963. Astronaut Group 1; astronauts; B. G. McNabb; Cal Fowler; Calvin D. Fowler; Convair; General Dynamics/Astronautics; Hangar K; Mercury 7; Mercury Seven; NASA; National Aeronautics and Space Administration; Original Seven; Project Mercury; Sigma 7; space; Wally Schirra; Walter Marty Schirra, Jr.
“Countdown "Key" Given to Schirra by Convair Crew .” RICHES of Central Florida accessed April 24, 2019, https://richesmi.cah.ucf.edu/omeka/items/show/6418.